I love cars, you probably noticed that. I write about them quite often in the Cars/Motorsports category here on my blog and I talk about them rather often too. 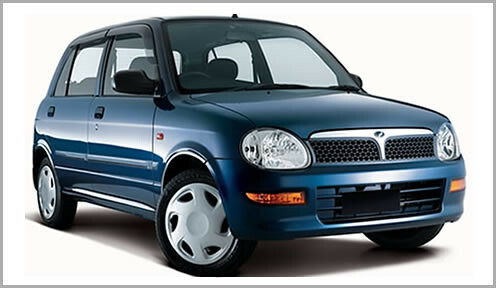 My first car was way back in 2002, I was quite old when I got my first car at 24 (for UK standards anyway). I sold it off back in 2004 when I was shifting over to Malaysia. It’s kinda hard to choose your first car, you need something fuel efficient, cheap to maintain and spacious enough to fit your crew. When I first came over here the popular model was the Kelisa, it’s such a tiny car I was actually quite surprised to find I could fit inside and drive it quite comfortably! I have quite a lot of experience driving the Kelisa and it’s really quite fun, the handling is GREAT – it’s almost like driving a go-kart. It makes Perodua a really good choice for a first car, especially the Myvi which has sold like hotcakes – their cars really are great value for money. They have a knack of making small cars that are really roomy on the inside, well equipped in terms of features and affordable. You could say the Kancil, the Kelisa and now the Myvi have mobilized a whole generation of Malaysians! To celebrate the new page they have a contest, all you need to do is make a short video and post it up on the Perodua fanpage. The winner will be chosen by a panel of judges and the judging is based solely on creativity, originality, completeness and relevance of the video clips and title of the contest. It can be funny, quirky, meaningful or heartfelt. It can be with a Perodua car or not – either is fine! It can be a dance, a spoof of anything – basically why Perodua is Lagi Best. The prizes are awesome, the Grand Prize is worth RM10,000 and there are 5 consolation prizes of iPads for runners-up. So go ‘Like’ Perodua on Facebook NOW and get working on that video! This contest is open to all Malaysians 18 years old and above. 6 Responses to Cars Cars Cars! 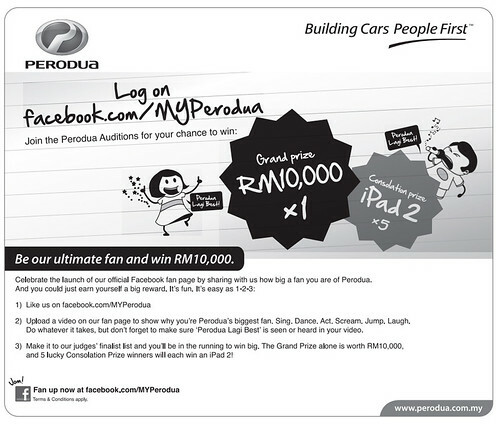 & The Perodua Auditions. wah u can fit inside!!!! Huai Bin: That wasn’t the surprising part for me actually, I was surprised I could fit in the BACK seat comfortably! Mark: Hahhaa, we’ll have to crack cloning first.